There are two meanings of the phrase sanatan dharma. One is political, and the other philosophical. The political sanatan dharma emerged as one of the two responses to European Orientalists who saw Hinduism as a pagan, polytheistic and idolatrous race. One response, the Samaj response, was to reform prevalent Hindu customs and beliefs and make it worthy of colonial approval. So emerged many organisations that rejected worship of plants, animals, rocks and images and saw God in formless monotheistic terms. These reformers focused on prayer and prayer halls, creating something like a ‘Hindu church’. The other response was to argue that the European Orientalists driven by missionary and colonial zeal had deliberately misunderstood all things Hindu. They argued that Hinduism was the greatest ‘original’ religion of the world, emerging from India and spreading around the world through noble people, which is Arya in Sanskrit. In their worldview, in the original sanatan dharam there was no class or gender or caste hierarchy. There was no corrupt sensuality. There was even great technology, like nuclear missiles, plastic surgery and planes, memory of which can be traced to the Vedas. These were the sanatanis, i.e. those who saw themselves as aligned to ‘original’ Hinduism. The philosophical sanatan dharma means ‘timeless principles’. It refers to natural aspects of human existence, untainted by cultural demands. 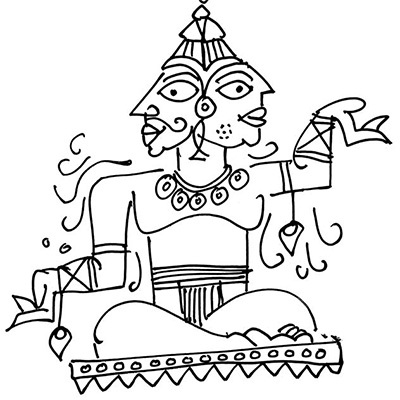 It refers to the world of physics (ajiva), the world of biology (sajiva), and the world of psychology (brahma). The world of physics is the world of inorganic elements (pancha-bhutas). The world of biology is the world of senses (indriya), emotions (chitta), of botany and zoology (chara-achara). Then comes the world of psychology, where one has to deal with imagination (manas) fuelling our hungers and fears that shape our personality (aham), and the human ability to imagine an entity that has outgrown all hunger and fear (atma). This idea is a-contextual and a-historical. It belongs neither to history nor to geography. It is not limited to a gender, or a caste, or a class, or an age. It is not dependent on your sexuality or your education or your bank balance or your father’s name. It is accessible to all. Provided you are sensitive enough to hear it, and see it, around you. That is why Vedic wisdom was called Shruti (that which is heard) and darshan (that which is seen). We have a choice today: to continuously be ashamed of the past (like reformers) or argue about the perfection of the past (like sanatanis). Or we can try to reframe Hinduism for contemporary and future needs. In the early 20th century, Hinduism was reframed in ‘celibate masculine’ terms to satisfy the needs of the Freedom movement. In the 21st century, we need to reframe it to satisfy the needs of the Internet-using international generation, that does not need to fall back on misogyny, casteism, food and sexual taboos to feel empowered. A new world is emerging, and the political sanatan dharma seems out of sync. The philosophical sanatan dharma, by contrast, is as relevant now as it was then.